By the late seventies Lowell George was becoming increasingly disillusioned with the direction his band Little Feat were taking. He is on record as saying that the growing influence of jazz fusion from certain other members was having a detrimental effect on the sound of the band. With that in mind he disbanded the group during the sessions for “Down On The Farm” and fully turned his attention to his solo album. He had signed a contract to make a solo album some three or four years earlier and had been delving in and out of ever since. 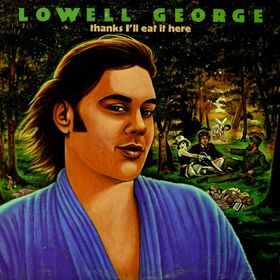 “Thanks I’ll Eat It Here” is a short nine track affair of little more than half an hour but it manages to cover many styles and display George’s talent in a very easy and accessible way. Surprisingly for a songwriters solo album most of the material is written by people other than George and there are only three tracks on the album co-written by him and just the one sole composition which is actually a reworking of an old Little Feat track. The album may be short but it doesn’t lack for quality of material or performance and also manages to feature a multitude of top quality guest musicians. Far too many to list here as they number more than thirty! But if I mention the likes of Bonnie Raitt, Chilli Charles, Nicky Hopkins, Jeff Porcaro and Jim Gordon you will get the idea of the quality we are talking about. Things get under way with the Allen Toussaint penned ‘What Do You Want The Girl To Do’ which had originally been aired on Toussaint’s 1976 album “Southern Nights”. The George version is pretty true to the original although it has been rocked up just a little bit from the slightly more laid back Toussaint version. The song builds up beautifully and has a truly wonderful hook and I can’t quite figure out why no one has managed to turn it into a major hit. It sounds to me like the type of thing that someone like Stevie Wonder would have had a massive hit with. The George version is as good as any I have heard and his style of singing and playing fits the Toussaint style of writing perfectly. Something that was also evident from the Little Feat version of ‘On Your Way Down’ from a few years earlier. The backing vocals and horns are the icing on the cake and it is a perfect start to the album. ‘Honest Man’ also has that great funky bouncy feel with some great backing vocals, keyboard and horn work. Again reminiscent of Toussaint, Muscle Shoals and the like it competes with the opener for the accolade of best track on the album for me. The funky vibe continues into the third track ‘Two Trains’ which originally appeared on the Little Feat album “Dixie Chicks”. The funk here though is joined by a healthy smattering of southern boogie rock and a little bit of lowdown dirty blues. If you imagine Lynyrd Skynyrd with a horn section and a bunch of funky backing singers you won’t be far away from the effect. The Ann Peebles classic ‘I Can’t Stand The Rain’ is the rather surprising choice for the next track and although George’s voice is in no way comparable to that of the composer he does a decent enough job of it and the arrangement gives it a different identity to that of the original. Much faster and more upbeat it also benefits from some great female vocals. On paper it looks like an experiment that shouldn’t necessarily work but the evidence on tape proves otherwise and it completes a wonderful four track opening salvo to the album. Things deteriorate slightly with ‘Cheek To Cheek’ which has a feel of Spanish/Mexican gypsy music and really does nothing for me at all but fortunately the quality is back in abundance with the magnificent ‘Easy Money’. A sleazy jazzy blues rock romp from the pen of Rickie Lee Jones it conjures up some marvellous images and is three and a half minutes of pure aural delight. Something similar can be said of ‘20 Million Things’, a simple little song the beauty of which is nigh on impossible to put across in words. ‘Find Me A River’ is a simple country folk type tune by Fred Tackett, who co-wrote ‘Honest Man’ with George. Whilst it is not of the same quality as its predecessor it is still pleasant enough and worthy of its place, particularly for the easy on the ear chorus. The album ends with the curious ‘Himmler’s Ring’. A strange almost musical comedy vaudeville track from Jimmy Webb it sounds ridiculously out of place at first but after repeated listening it sort of gains a ‘so odd its good’ feeling. That is not to say the performance is bad it just doesn’t fit in with the style of the rest of the album at all. Something which I also think can be said of ‘Cheek To Cheek’. The inclusion of those two songs is a little puzzling as there are two other tracks recorded around the same time that sit far better ‘Heartache’ which has been included in the CD remaster and ‘China White’ which is available on a Little Feat bits and pieces compilation. It is impossible to close without mentioning the cover art by Neon Park which at first glance may just appear to be a portrait of George wearing a bathrobe in a garden. However if you look more closely you will see that the backdrop is a version of Edouard Manet’s Le dejuener sur l’herbe with Bob Dylan, Fidel Castro and Marlene Dietrich as the diners! George toured briefly to promote the album and gave an interview to Bill Flanagan in which he stated that it was his intention to reform Little Feat but without Bill Payne and Paul Barrere who he felt were harming the Little Feat sound. Sadly, eleven days after the interview in June 1979 Lowell George died of heart failure aged only 34. The remaining members of Little Feat regrouped and completed the “Down On The Farm” album and included George’s contributions but this 1979 solo album was the last completed work to be released before his death …… and for me it may also have been his best. This entry was posted in Album Reviews and tagged Album Reviews, Allen Toussaint, Ann Peebles, Bill Flanagan, Blues, Classic Rock, Honest Man, I Can't Stand The Rain, Jimmy Webb, Little Feat, Lowell George, Martin Leedham, Music, Music Review, Neon Park, Pop, Rickie Lee Jones, Rock, Singer/Songwriter, Thanks I'll Eat It Here, Two Trains, What Do You Want The Girl To Do. Bookmark the permalink. This may be obvious, but the version of Two Trains on this album has completely different verses to the Little Feat versions. Does anyone know the background to the different lyrics?